Drinking water is one the most important and fundamental elements every human needs to prosper. Having access to clean drinking water was declared as a universal Human Right by the United Nations in 2010 . Nevertheless, in reality there is a lack of quality access to drinking water – at least 2 billion people use drinking water sources contaminated with feces. Contaminated water can transmit diseases such as diarrhea, cholera, dysentery, typhoid, or polio. Contaminated drinking water is estimated to cause 502.000 diarrheal deaths each year . There are different ways of testing water for its drinkability. One common approach is to use standardized testing strips, as their application is quick and cost-efficient. 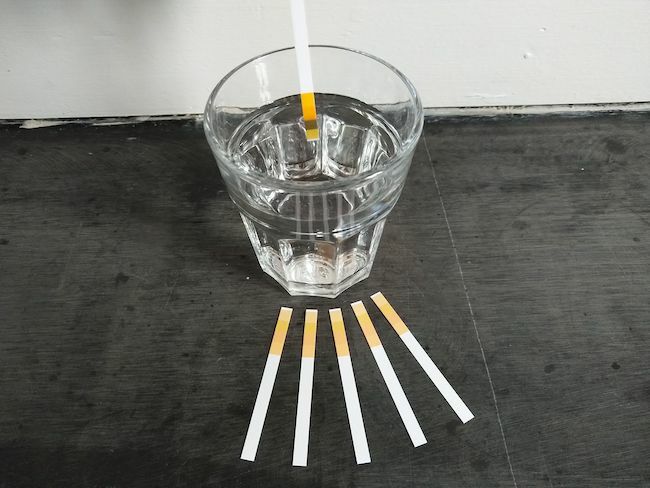 However, the test results of water testing strips can be flawed by interpretation errors, as the person carrying out the test has to compare the colors on the strip with a reference card. Additionally, tests from different persons may result in different outcomes. The goal of this research topic is to explore and develop easy to use solutions with the help of mobile applications to replace and assist the human eye and interpretation with the help of a smartphone’s camera and context-sensitive visualizations. Recommended prior knowledge: Android App development and basic understanding of computer graphics (image processing). Students who wish to work in this area, please apply via email to deco-teaching@inso.tuwien.ac.at with a short statement about your background and interest related to this research topic. Last semester’s design task of the Mobile (App) Prototyping and Evaluation (MPE) lecture at DECO was to create, prototype and evaluate innovative applications and solutions for improving the personal use of big data for individual users by utilising the theoretical concept of unlimited availability of big data, themed “Turning Big Data into Small Data”. Last semester’s design task of the Mobile (App) Prototyping and Evaluation (MPE) lecture at DECO was to create, prototype and evaluate innovative solutions in the field of social networks for professional athletes and their fans. Team Nimble and team Shariteam from our hackathon event “Helpathon” (for creating innovative solutions for individuals and groups in need) are working on their projects in cooperation with the Red Cross Vienna. This Friday afternoon (September 9th) they are presenting their projects at the one year anniversary of the refugee house Lindengasse from Red Cross Vienna. For more information about the event, please visit the event’s facebook page. Last semester’s design task of the Human Computer Interaction seminar at DECO was to create, prototype and evaluate innovative solutions for the future of money, payment, banking and financial services. The seminar was based on results from a 2-day hackathon event called Bankathon/CashTechThon, organised by the Research Group for Industrial Software (INSO, Vienna University of Technology). A team of three students completed the seminar, resulting in an innovative application called “PoMMo” that brings pocket money to the smartphone for both kids and their parents and helps children learn how to manage money. “PoMMo (Pocket Money Mobile) is an application for both kids and their parents that brings pocket money to the smartphone. Digital pocket money can be spent, managed and sent using an intutive interface. Through independently managing their own pocket money, kids learn how to deal with (digital) money and to take responsibility for their spending. Two separate apps, one for kids and one for parents, interface with each other to provide one comprehensive experience. “More than half a year ago we participated at the Helpathon TU Vienna. After winning the 2nd price we decided to continue the work on our concept. So we moved on and started to meet the organising team of the Red Cross Vienna to gather more information. Also we met the teams of two refugee houses in the Vordere Zollamtstraße and in the Lindengasse. What we learned after hours of research and numerous talks was a wide overview of the variety of challenges the Red Cross faces every day in the refugee houses. Some are big, some are smaller but often the staff can’t solve even the smallest problems because they simply don’t have enough time or the problems are too specific. That’s why we came up if a new concept: Organise an event where volunteers and refugees work together to solve as many of those big and small problems as possible. 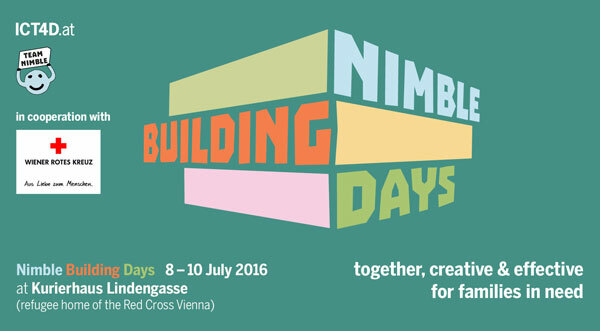 The Nimble Building Days take place on July 8th, 9th and 10th in refugee home Kurierhaus Lindengasse of the Viennese Red Cross. Now we are looking for support! Participate in the Nimble Building Days or make a donation on their website! Send us a private message on our Facebook page or write an email to office@ict4d.at. We’d like to announce a special event called “Bankathon / CashTechThon CTT’16“, a 2-day hackathon event for creating and prototyping concepts, models and artifacts for innovative IT-solutions for future forms of banking, payment, the administration of hard cash, accounts and wallets, the digital identification of individuals in the payment process, the prospective organisation of finance products as well as organisations that handle those fiduciary. The event is organised by the “Research Group for Industrial Software” (INSO, Vienna University of Technology), together with partners from university and industry, to bring together students and stakeholders from different areas to challenge the possibilities of information technology. It will be held with friendly support of “Payment Services Austria” (PSA). PSA introduced the mobile debit card for smartphones in 2015, being first worldwide to implement this innovative service for a whole country. The event will be held on the 23rd and 24th April 2016 at the Vienna University of Technology (Karlsplatz 13, 1040 Wien). Registration is free for all participants. For more information regarding the event and the registration, please visit our website: www.bankathon.at (German) or www.cashtechthon.at (German). We’re happy to announce that the registration for this term’s HCI Seminar is now open. The task for this term is the conception, prototyping, and evaluation of “Innovative Banking & Payment” mobile applications. The seminar is held in conjunction with a 2-day hackathon event, organised by the Research Group for Industrial Software (INSO, Vienna University of Technology). You’ll have the opportunity to develop a prototypical application for a mobile platform utilising a user-centered design process. We provide a methodological framework and you can show your creativity in the practical implementation. If you’re interested in participating, please visit the course website for further information about the topic, schedule and registration. We would be happy to welcome you in our seminar. Last semester’s design task of the Human Computer Interaction seminar at DECO was to create, prototype and evaluate innovative solutions for individuals and groups in need. The seminar was based on results from a 2-day hackathon event called Helpathon, organised by the Research Group for Industrial Software (INSO, Vienna University of Technology). We are happy to announce a special event called “Helpathon“, a 2-day hackathon event for creating and prototyping innovative solutions to help people in need. The event brings together students and stakeholders from different areas to challenge the possibilities of Information Technology in order to support affected people. A lot of difficulties arise from lack of coordination, communication and access to information. Information Technology seems to be well-suited for finding solutions to bridge the gap between those who offer help and those who are in need. The Helpathon will be organised by the Research Group for Industrial Software (INSO, Vienna University of Technology) of Prof. Grechenig. It will be held on the 14th and 15th November 2015 at the Vienna University of Technology (Karlsplatz 13, 1040 Wien). DECO (Designing Comfort) is an interdisciplinary research team inventing and improving new forms of interaction with computer systems. We are part of the Research Group for Industrial Software (INSO) at TU Wien.